The trails are very easy to follow but convoluted – it’s easy to get misplaced. The terrain is typical Ozarks karst rocky steps with glades and lots of seeps. The trail can get very muddy and wet after rain, and the trail running along side the Sac river floods. View a larger version of the Sac River Trail, Springfield, MO trail map on Google maps. Download our Sac River Trail kmz file for Google Earth or your GPS receiver. 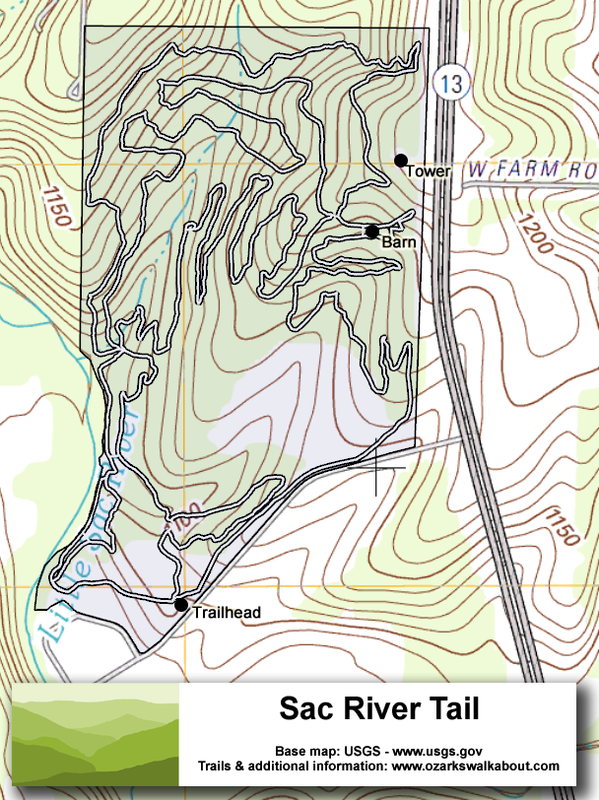 The KMZ file includes a full USGS topographic map of the wilderness. To get there, just take Highway 13 (Kansas Expressway) north out of Springfield. About three miles past I-44 (and the diverging diamond interchange), you’ll see a cell phone tower at the top of the hill. Just before the tower, turn left onto a paved drive that leads to both the parking lot and the northwest water treatment plant.